The so-called “Internet of Things” is coming slowly but surely into every home. In the Internet of Things, participating devices form a network and communicate using protocols and technologies similar to those used by web browsers and web servers. The most commonly seen examples today are smart TVs, but other devices are already following. 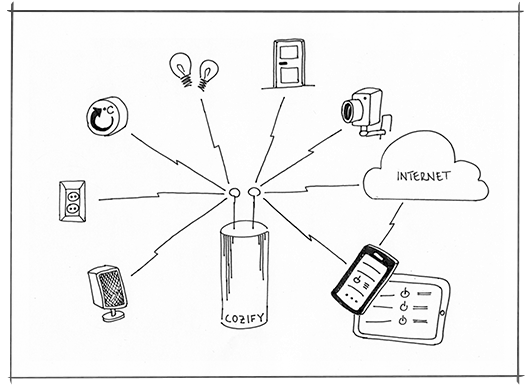 At Cozify, our own vision is closely based on the ideology behind the Internet of Things: that devices communicate wirelessly without complex setup and are easily accessed while at home or away through mobile applications. Thus, easy setup and simple use are the foundations of Cozify home automation. How does Cozify home automation work technically? Our system utilizes wireless technologies, especially the WiFi network that most homes have today. To ensure as wide device compatibility as possible, we also support Bluetooth and Zigbee radio interfaces. A constant connection to internet is not required for home operation, but only to control the system remotely. In the case of a power outage, doors can still be locked and unlocked using key, and if the home WiFi network is not accessible, lights can always be switched on or off from the switch on the wall. The Cozify hub is the heart of the system. The hub connects all devices together and provides the link to our cloud services. Both user requests and device status notifications go to the hub, and action commands are sent out based on the received information. Themes, predefined by the user, allow easy control of multiple devices and groups, but individual control is always possible as well. A theme is a collection of settings the user would like to apply in certain circumstances and conditions. Themes are created and stored to the hub using the Cozify mobile application. For example, a Night theme could turn on dimmed lights, lock doors, verify that garage and warehouse doors are closed, and activate door and window sensors. Even a preferred bedroom temperature could be set as part of this theme: only the imagination is the limit. As can be seen, home automation can potentially cover everything from lights and entertainment to core systems like furnaces, boilers, and air conditioners, allowing the home owner great freedom to monitor activity, adjust mood, and improve efficiency. The possibilities are endless. Everyone is warmly welcome to discuss, challenge, and brainstorm about what the future could bring. Please, start by commenting below. Why did we choose lighting?